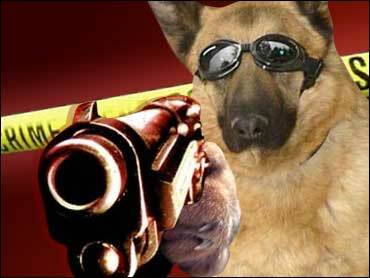 Dog Shoots Man? That's News! Deputies say a man in Pensacola, Florida, who was trying to shoot seven puppies was shot by one of the dogs. The man was holding two of the shepherd-mix puppies when one of them wiggled and put its paw on the trigger of the man's .38-caliber revolver, making it discharge. Escambia County deputies say 37-year-old Jerry Bradford was shot in the wrist and was treated at an undisclosed hospital. To top it off, the sheriff's office issued an arrest warrant charging Bradford with felony animal cruelty. He says he was shooting the 3-month-old pups because he couldn't find another home for them. Three of the puppies were found in a shallow grave behind his house, the other four were taken by animal control, which intends for them to be adopted.